Below is a list of some of the most important historic sites in our area. if you have a site you think should be included please e-mail us via our contacts page. This has been localised and kindly supplied to us from North East Lincs Council. 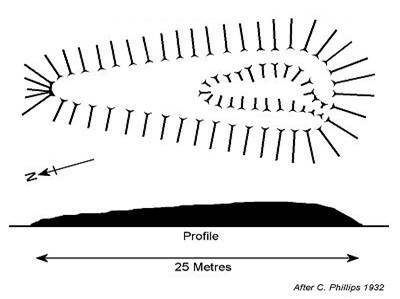 On an east facing ridge that separates 2 dry valleys, the Neolithic trapezoid mound of Ash Holt is one of the smallest long barrows in Lincolnshire, measuring around 24 metres in length and 12 metres at its widest point, tailing off to under 6 metres towards the north. It still stands to a height of 1.4 metres at its southern terminal, the northern end now being only around half a metre high. Orientated southsouthwest by northnorthest and following the contours of the land at a height of 75 metres above sea-level, it is badly overgrown and has a pit dug into it at the southern end – there are now no signs of any ditches. Beacon Hill was partly excavated in the 1930’s when Neolithic worked flints were discovered in the area around the barrow and it was noted that its dimensions measured about 14 metres long, 7-8 metres wide and with a height of about 3 metres, its oval mound being aligned northwest-southeast. There is the possibility that the site started out as a long barrow although its size would make it the smallest in Lincolnshire by a long way, unless a substantial amount of earth has subsequently been removed. It is more probable the slightly raised northeast-southwest strip of land running from Cleethorpes towards Scartho (bounded in part by the modern A46 and A1098 roads) was valuable to the early inhabitants of the area and continued to be so during the Bronze Age when the mound probably dates from. The excavators certainly found remains from this period including a large plain urn which held not only cremated remains but also four smaller urns each containing the cremated remains of a child. These smaller urns were all decorated as was a further urn nearby which was also found to hold a child’s cremated remains. The finds were all from well above the original ground surface and are hence thought to be secondary burials, the primary burial is presumably still undisturbed. The barrow was also found to contain an Anglo Saxon bowl which probably accompanied a lost intrusive burial in the side of the mound. The mound was again reused during the Medieval period, this time as the site of a beacon which also gave its name to the site and it could be that the barrow’s shape was changed from a circle to an oval at this time – although the reason why is not known. Well-preserved Deserted Medieval Village under permanent pasture. Now one of the few better remaining sites in this part of the world. The remains fall into two main areas: to the North East a church site within a rectangular enclosure and associated earthworks. To the South West (of the present farmhouse) a clear and hollow way snaking through an area containing tofts and crofts, bounded by banks and ditches up to 1m deep. The monument includes a 17th century earthwork fort situated on high ground close to the road from the Humber to Boston and Kings Lynn, and within easy reach of the road from Newark to the Humber via Gainsborough. It comprises a rectangular earthen rampart with projecting bastions at each of its four corners, an enclosing ditch, and a counterscarp bank. The area enclosed by the rampart is 130m long, south-west to north-east, and 50m wide, south-east to north-west. 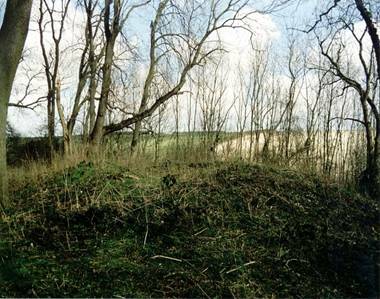 The surrounding rampart is up to 1.5m high, 6m wide at the base, and between 1m and 1.2m wide at the summit. A square earthen bastion projects from each corner of the rampart. They are each between 10 and 12m square. These bastions would have provided positions for guns giving covering fire for the ramparts and gateways. The waterlogged ditch is 8m wide and up to 2m deep and the counterscarp bank which encloses it is up to 1m high and 3m wide. This bank has been eroded in places by plough action. Access is now afforded to the interior of the fort by two earth causeways which cross the south-eastern and north-western arms of the ditches. Although these causeways are not considered to be original features, being formed by pushing part of the rampart into the ditch after the fort was abandoned, they may mark the site of original access points or gateways. The fort is believed to have enclosed a hall belonging to the Holles family. The Holles family, ennobled by James I, was split by the Civil War; Denzil, an MP, commanded Parliamentary troops, while his cousin Gervase, MP for Grimsby, was a prominent supporter of Charles I. Such fortification of manors was fairly common during the first English Civil War (1642-46), and is also recorded in Humberside at Scorborough, home of the Hotham family. The battle to control Lincolnshire was fiercely contested throughout late 1642 and 1643. For much of this time the king’s forces controlled much of the county and sought to prevent the Parliamentarians in Hull and Boston from communicating and from moving troops up and down the county. It is likely that this monument was built at about that time, by the king’s forces, to keep a watch on the major north-south routes. The monument includes standing, earthwork and associated buried remains of a small medieval abbey and the site of a post-dissolution manor house. It also includes a small icehouse, which is a Listed Building Grade II. The monument does not include St Peter’s Church and its surrounding churchyard as these remain in ecclesiastical use. Humberston Abbey was founded in the reign of Henry II (1154-89), probably around 1160, by William FitzRalph, a local landholder. Dedicated to St Mary and St Peter it was a house of the Tironian Order, a reformed branch of the Benedictines. Although it had links with Hambye Abbey in Normandy, it was never regarded as an alien monastery and thus avoided the general confiscation by Richard II in 1391 that saw the closure of other Tironian houses in England. It was never a large or rich establishment and is thought to have only housed a dozen monks at most. However, it was an important local landowner with nearly 1000 acres (over 400ha) in Northern Lincolnshire, as well as holding other lands managed by bailiffs elsewhere in the country. Badly damaged by fire in 1226 and 1305, 14th and 15th century records note many disagreements between the monks and lapses in discipline. The house was one of the first to be suppressed by Henry VIII at which time the annual income was 34 pounds, supporting an abbot, four monks and a lay-brother. Most of the abbey buildings were demolished by 1562, with the western end of the abbey church retained as a parish church. Apart from the 15th century tower, the church, now just dedicated to St Peter, was rebuilt in 1720-22. Following the Dissolution, a manor house, recorded as Abbey House in 1708, was built on a raised platform to the south of the original abbey buildings. This was later demolished and replaced by the current house closer to the church in the late 18th or early 19th century. This is also a Listed Building Grade II. The abbey is believed to have been constructed on an earlier Christian site as examples of Anglo-Saxon carved stonework, of mid-10th to early 11th century date, are built into the walls of St Peter’s church. Other fragments have also been unearthed during excavation in the area. Amateur excavations, conducted by A Tailby between 1965 and 1970, uncovered substantial remains of the cloister, typically standing up to 0.75m high, immediately to the south of churchyard. Two graves and part of the east end of the abbey church were also uncovered within the paddock to the east of the modern churchyard. These excavations also demonstrated that the icehouse, 40m east of the manor house, is an original part of the southern range of the cloister and is in fact a vaulted passageway through the south cloister range. It now appears semi-sunken into the raised modern ground surface, and is 6m by 3m by 2.5m high and lies beneath an earthen mound 10m across and up to 3m high. http://beehive.thisisgrimsby.co.uk/default.asp?WCI=SiteHome&ID=2633&PageID=11927 these features are included. Would be good to go walks to these places with knowledgeable people, just a thought……..? Hello Mike, I’ve passed on your info and we shall see what we can come up with. All very interesting,I’m looking for records giving surnames if possible for the Claypole Newark areas of Linconshire;As well as ‘background ‘information on the area.